On September 13, 2017, The Feast of the Holy Cross, His Grace Mar Awa Royel, Bishop of California elevated Rev. Deacon John Piro to the ecclesiastical rank of presbyter at Mar Zaia Cathedral in Modesto, California. Rev. Fr. John will serve as an assistant priest at Mar Addai Parish in Turlock, California. 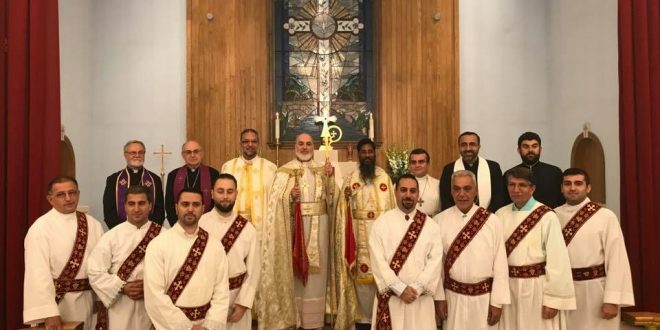 Following the ordination, His Grace Mar Youhannan Yousip, Auxiliary Bishop of India, celebrated the Holy Mysteries and there was a fellowship meal in the Church Hall. Reverend Qashisha John Badal Piro was born on February 7, 1973 in the city of Turlock, CA. to his father Reverend Cor-Bishop Badal S. Piro, and Bereshwa Piro. He is the youngest of 7 children. He began his ecclesiastical education in the Assyrian Church of the East in both Syriac language and liturgical service at the hands of his father beginning at the age of five years. This was instrumental in building a strong foundation in the Apostolic faith of the Church of the East, which is evident to this day. At the age of 12 years, he was ordained a hypodyakhna (subdeacon) for Mar Addai Parish and served both in his liturgical role, as well as the organist for both the Divine Liturgy and wedding ceremonies. At the age of 18 years, he was ordained a deacon for Mar Addai Parish, and has served in this capacity ever since, while continuing to further his ecclesiastical knowledge. He has been teaching both youth and adult Bible studies throughout this period, with most recently becoming the head of Christian Education at Mar Addai Parish. Rev. John was ordained to the sacred order of the priesthood on September 13, 2017, the Feast of the Holy Cross, by His Grace Mar Awa Royel, Bishop of the Diocese of California. The ordination took place at the cathedral church of Mar Zaia the Blessed in Modesto, California. Rev. John completed his elementary and high school education in Turlock at a time when there were not many Assyrian children enrolled in the Turlock school district. This experience was foundational in developing strong ties to his Assyrian community and his love of his Assyrian culture and identity, which he continually demonstrates today via his involvement in community events centered on Assyrian heritage. He completed both his Bachelors of Science and Masters of Science degrees in Physiology from the University of California, Davis. And in 2004, he obtained his Doctorate of Pharmacy from the University of California, San Francisco. Fr. John Badal Piro is married to Dr. Jesika Piro, a professor at the University of the Pacific School of Pharmacy, and together they have been blessed with three beautiful daughters: Jordyn, Justine, and Jianna. Sh. John’s family is also very active in Mar Addai Parish, in both the educational and community aspects of the parish and the Church. Fr. John is also a long-time practicing pharmacist and co-owner of Turlock’s New Vision Pharmacy. This community pharmacy has really allowed him the opportunity to further serve his Assyrian community in regards to their healthcare needs, which he finds the most rewarding aspect of his professional career. Lastly, Rev. John strongly believes in the education of our children and youth in the Christ-centered faith and liturgical services of the Church. He feels that through biblical study, with focus based on Apostolic Tradition of the Church, will better prepare the future generations of the Church for the growing challenges they will face in this world. Furthermore, the essential Orthodox prayer life of the Church can be reinforced in the younger generations to help them deal with the anti-Christian and secular onslaught they will encounter in our ever-changing world.